Back in 2004, Peter Molyneux and the team at Lionhead Studios released Fable, a game that somehow managed to receive high praise while at the same time being one of the most disappointing titles ever released. Molyneux severely over-hyped his creation, and when the open-ended world where you can do anything and be anyone wound up being merely an extremely enjoyable action RPG, critics were given the rare opportunity to praise and pan at the same time. Now Fable II has been released for the Xbox 360, delivering what Molyneux believes is a game much closer to his original visions. Do the critics agree? Hit the jump to find out. Gamespot Fable II starts when you're just a small child. Although your childhood doesn't follow the typical RPG path of burned homes and murdered parents, it encompasses a unique tragedy that provides the backbone for the rest of your adventure. Your path is one of vengeance; you'll spend the journey recruiting fellow heroes as you attempt to destroy the ultimate evil threatening Albion. The story is one of the weakest aspects because it focuses on your choices without creating interesting characters of its own, but it does provide a few powerful scenes. There is one section in which your morality will be put to the test, and the severity of your choices is on full dramatic display. 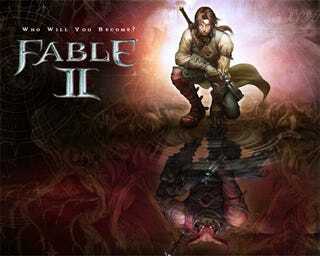 TeamXbox To be truthful, Fable II is really two games. On the one hand, it's a fairly typical action/adventure with RPG overtones. In that degree the game does well, offering quests that are varied and different and giving you enough leeway to customize and develop your character to make the experience of playing it feel like your own alone. On the other, it's an intriguingly complex life-simulator that explores some of the finer points of human behavior and the effects it has on our world around us. VideoGamer.com You might think that the dog is a gimmick and another of Peter Molyneux's over hyped features, but he's got this one right. After a few hours the dog will dominate all you do, whether it be wandering off the beaten track to find treasure or simply constantly looking around to see where he's gone. Moments where he lags behind suddenly become truly worrying, for fear that he's gone for good, and should an enemy dare to kick him you'll be sure that that's the last thing he ever does. Your interaction with him is fairly limited (he's a dog after all), but the bond is strong. CVG Once again, Fable II is all about choice. If you don't want to bother with Albion's troubles you can ignore the main quest and - like we did - setup shop as a humble blacksmith, build enough cash to buy a big house and then rent it out to the poor for a stream of profit every five minutes - even when you're not playing. Fable II offers an even more unique side quest experience at the end of the game when you can finally afford to buy the big castle at the top of the hill, marry a barmaid, have kids and create your very own Bowerstone credit crisis. Eurogamer Fable II's generous and forgiving template isn't one that many games choose to follow, but it proves convincingly that if you're clever enough, you can create a consistent challenge without resorting to mindless punishment, and you can craft a sharply told story that still has room for the player to express themselves within. Inclusive and often thought-provoking, this is a daring portrait of a game-world with all the failure cut out, and it's hard not to love a game that loves you so much in return. Fable II will charm you, thrill you, and leave you very, very happy. Sounds like Molyneux got much closer the second time around.